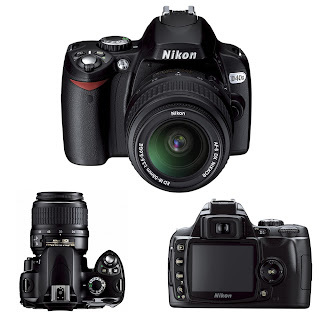 Last December, Nikon released the D40 ( ), an entry-level digital SLR with a very good 3x zoom lens at a nice price: $600. A mere four months later, Nikon announced the D40x, an enhanced version of the D40 that takes the original’s resolution from 6.1 to 10.2 megapixels and offers better ISO sensitivity and a slightly better burst mode. These additions drive the price of the D40x up to $800, but they also help Nikon compete more directly with Canon’s very successful (and more expensive). The end result is a very good camera that takes great pictures, and one that is a great fit for casual shooters who are DSLR newcomers, but who want a little more resolution. For all its power, the D40x is a marvel of size and design. Like its lower-priced sibling, the D40x is compact and lightweight, but its construction is solid. There aren’t a lot of extraneous buttons on the camera body, and the ones that are present are well-placed and easily accessible. The 2.5-inch LCD on the back is bright and clear, viewable in all but the brightest sunlight. The D40x starts up immediately, and you can take your first picture less than a second after powering it up. The camera offers fully automatic shooting and a group of modes for different conditions, like landscapes, portraits, sports, night shots, close-ups, and more. Touching all the bases, the D40x can also operate manually, or in aperture- and shutter-priority modes. A lamp on the front of the camera helps with autofocus in low light, and the pop-up flash has a red-eye mode. The flash also works well in fill-flash situations, letting you brighten the foreground to compensate for backlighting, for example. You can continuously shoot 3 images per second with the D40x, up slightly from the 2.5 images per second possible with the D40. If you’re shooting in Raw format, you can shoot a maximum of 6 images continuously. I was able to get 15 to 20 consecutive shots at the maximum rate when shooting in JPEG format. The D40x has a well-chosen set of features for novices, and their presentation isn’t overwhelming or intimidating. To help keep you from getting lost in the details, the D40x has an excellent built-in help system: If you aren’t sure what a setting will do, simply push the “?” button and a small help screen pops up on the LCD.